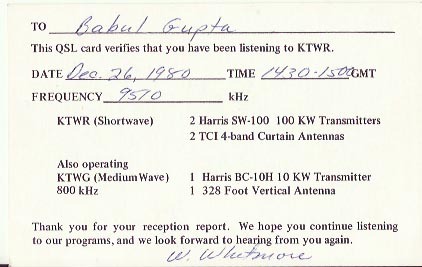 9570 kHz, 1430 hrs to 1500 hrs GMT log this station on 26th December, 1980. 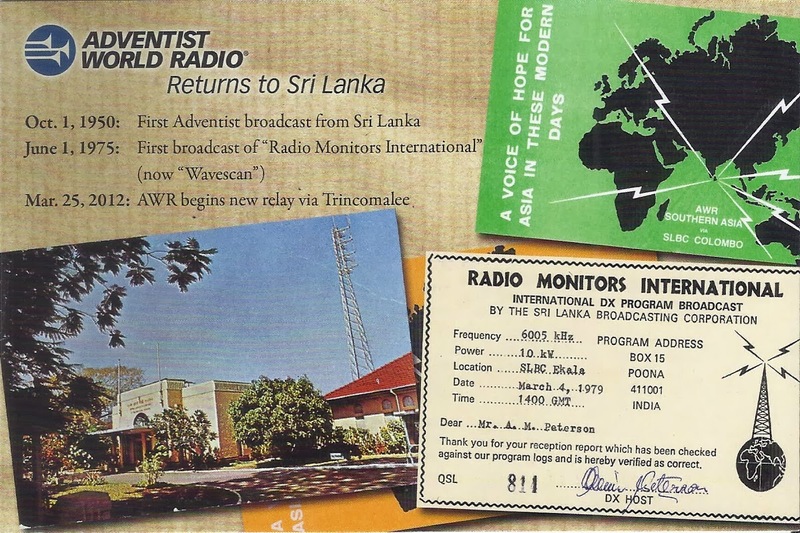 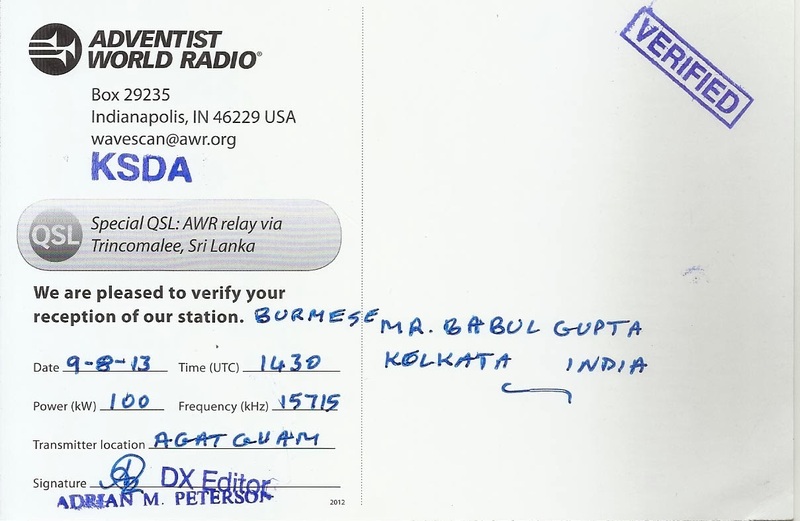 Adventist World Radio-Agat, Guam: 15715 kHz, at 1430 hrs in Burmese language log this station on 9th August, 2013 and f/d QSL card received on 20th October, 2013 for my email report. 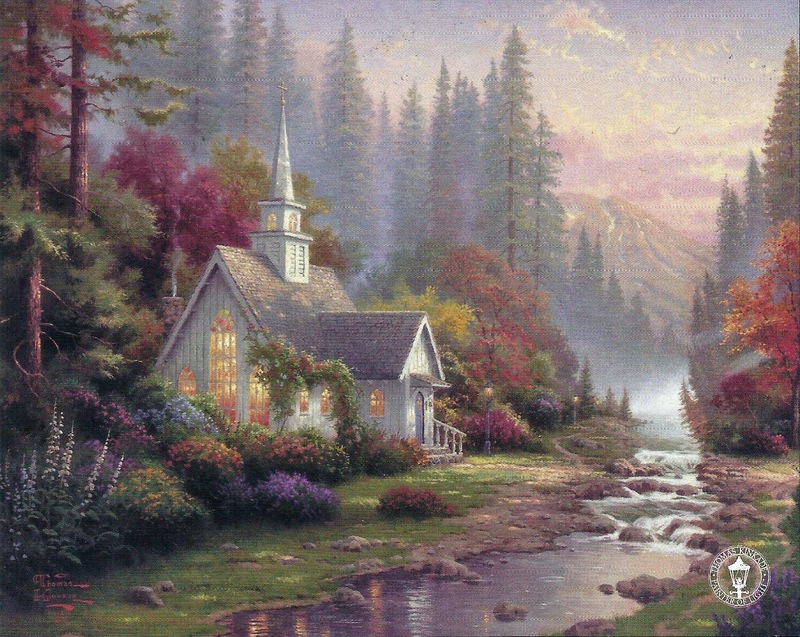 v/s Adrian M. Peterson. 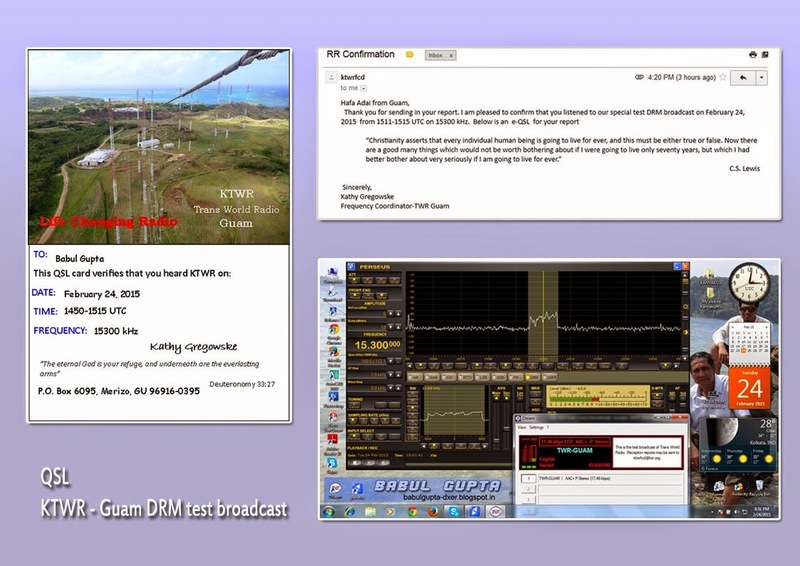 KTWR GUAM Special test broadcast in DRM: 15445 kHz at 1508 hrs to 1530 hrs UTC, log this station on 10th September, 2013 and f/d eQSL received on 11th November, 2013 for my email report. 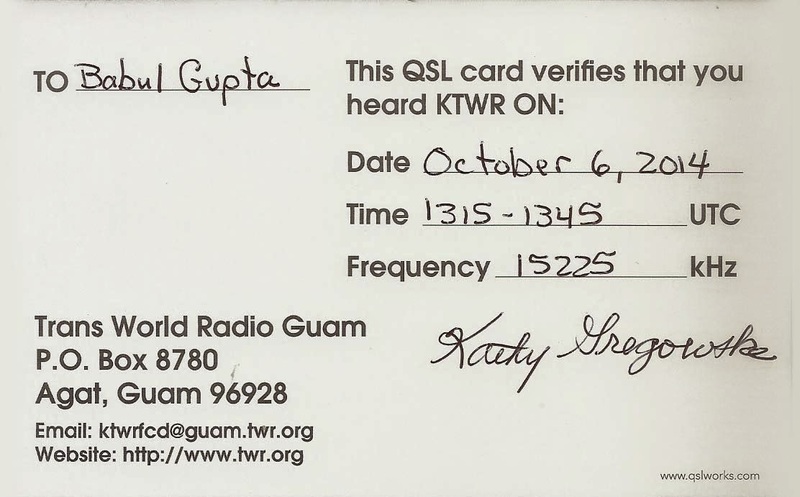 v/s Kathy Gregowska. 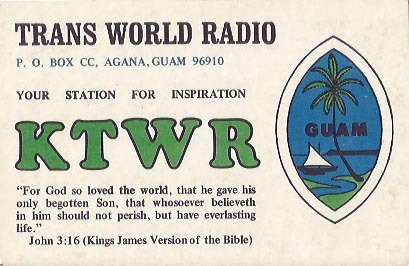 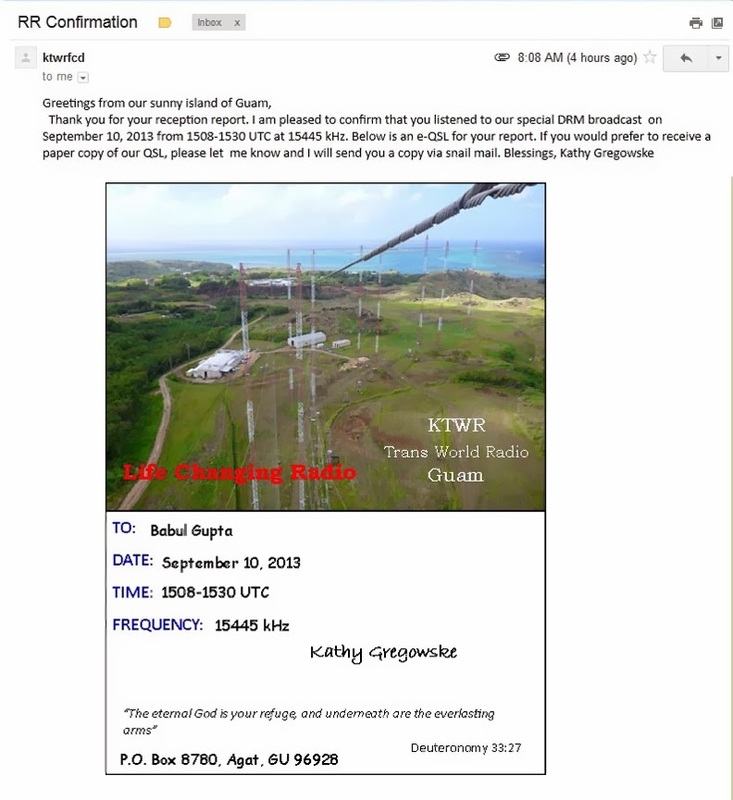 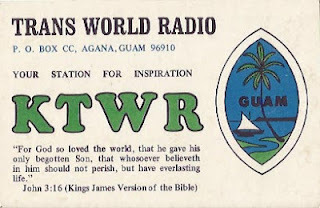 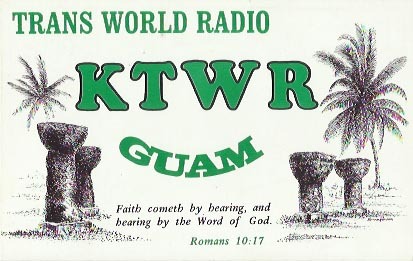 KTWR - Trans World Radio Guam: KTWR's test DRM broadcast on 15445 kHz DRM at 1508 hrs to 1530 hrs UTC log on 10th September, 2013 and f/d QSL arrived on 16th January, 2014 for my email report. 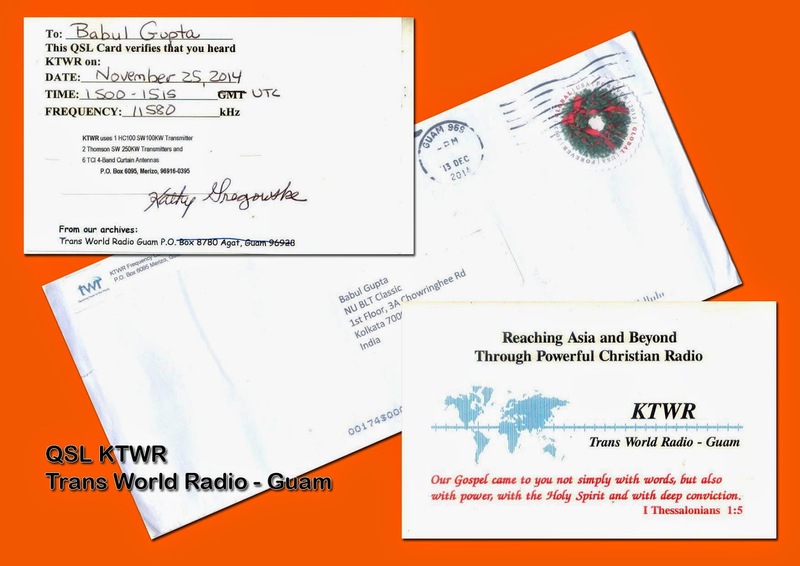 v/s Kathy Gregowske. 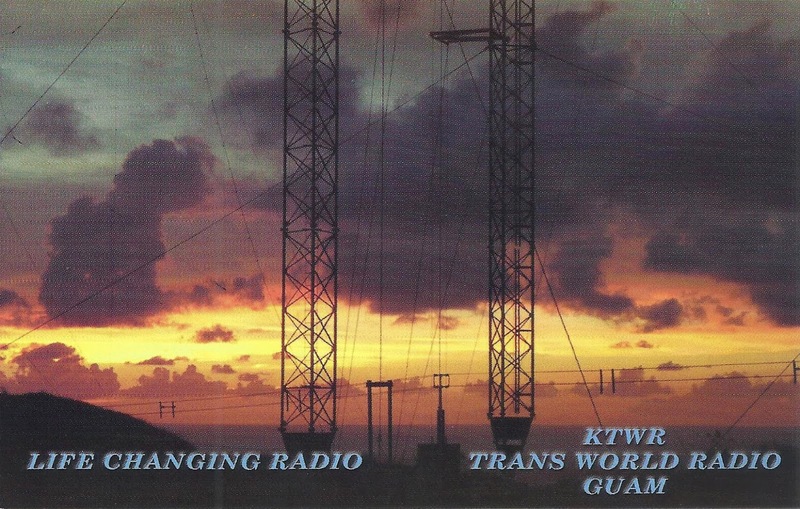 KTWR - Trans World Radio Guam: KTWR's test DRM broadcast on 13760 kHz DRM at 1505 hrs to 1530 hrs UTC log on 7th November, 2013 and f/d QSL arrived on 16th January, 2014 for my email report. 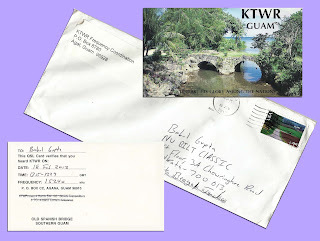 v/s Kathy Gregowske. 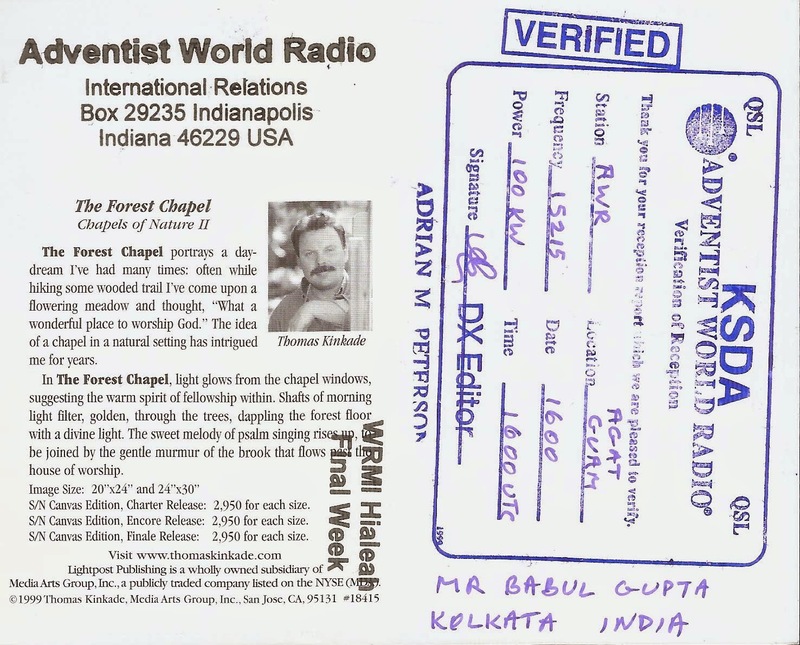 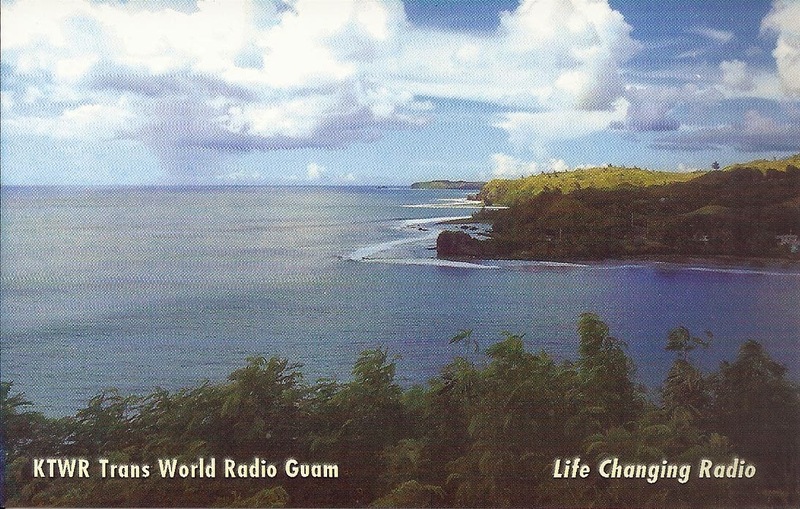 Adventist World Radio-Wavescan - Agat, Guam: 15215 kHz, 1600 hrs UTC log on 16th November, 2013 f/d QSL received on 9th June, 2014 for my email report. 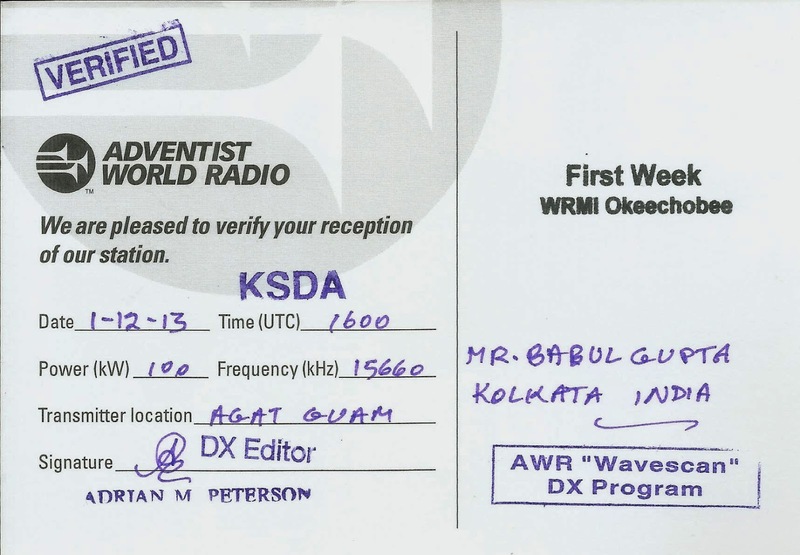 Adventist World Radio-Wavescan - Agat, Guam: 15660 kHz, 1600 hrs UTC log on 1st December, 2013 f/d QSL received on 9th June, 2014 for my email report. 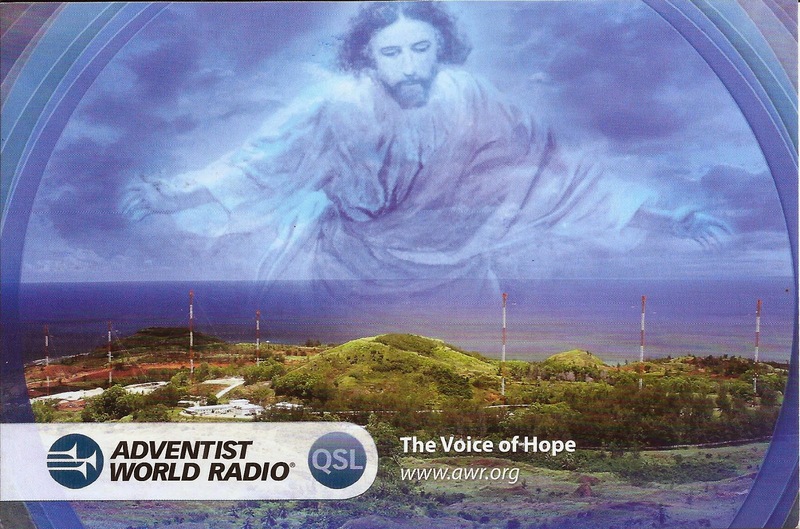 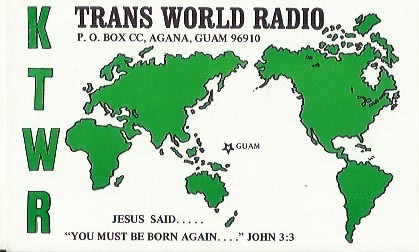 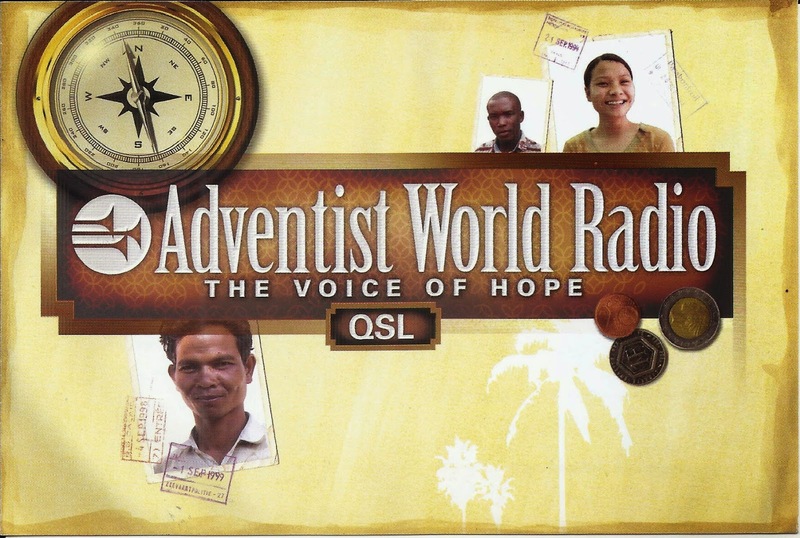 Adventist World Radio-Wavescan - Agat, Guam: 15660 kHz, 1600 hrs UTC lon on 15th December, 2013 f/d QSL received on 9th June, 2014 for my email report. 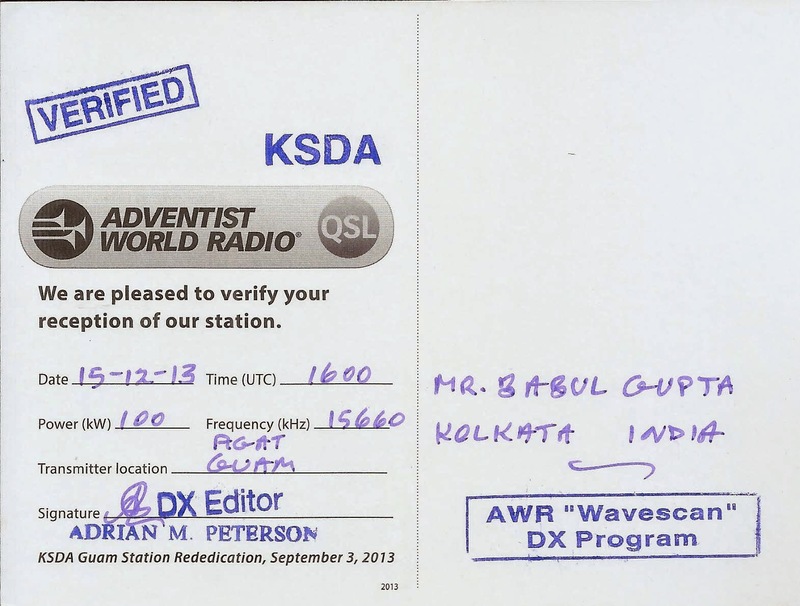 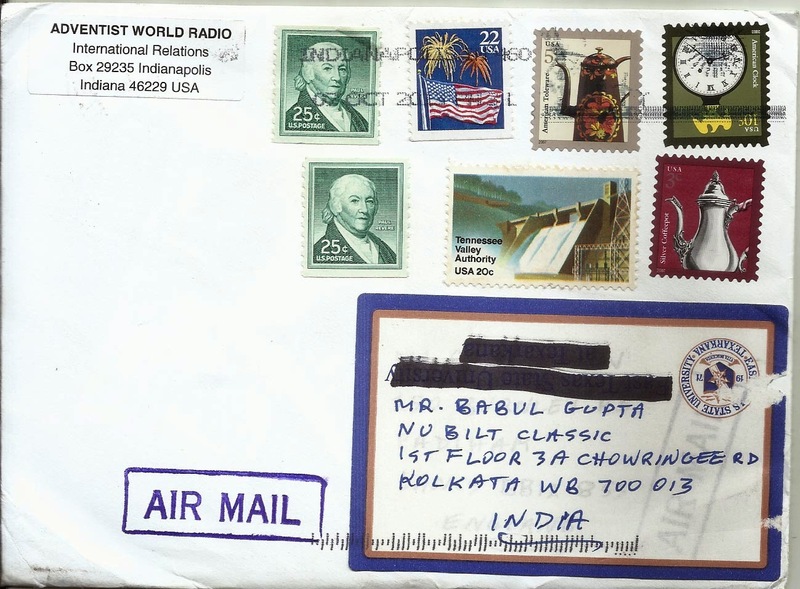 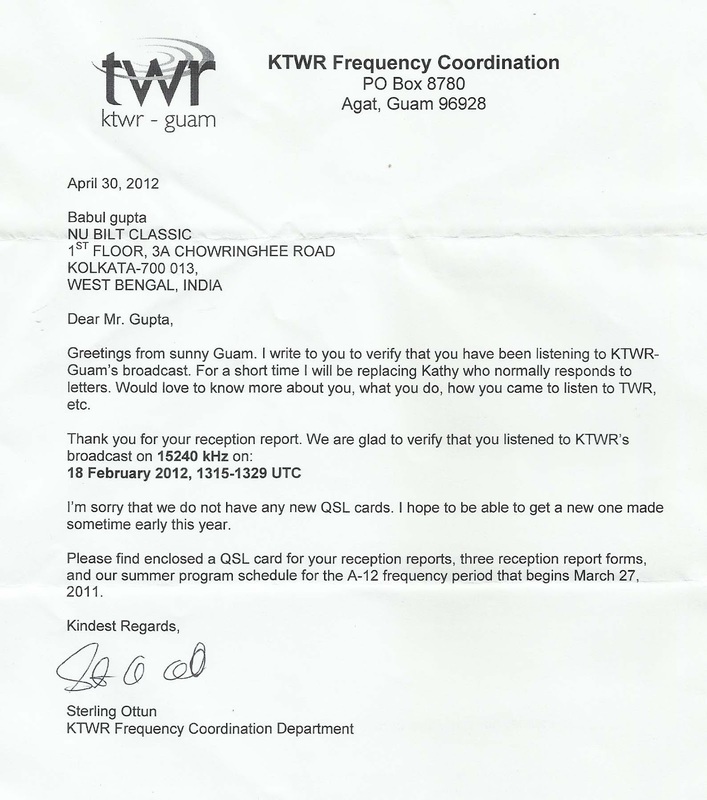 KTWR Trans World Radio Guam: 15225 kHz in Assamese at 1315 hrs to 1335 hrs UTC log this station on 6th October, 2014 and f/d QSL card with letter received on 29th October, 2014 for my email report. 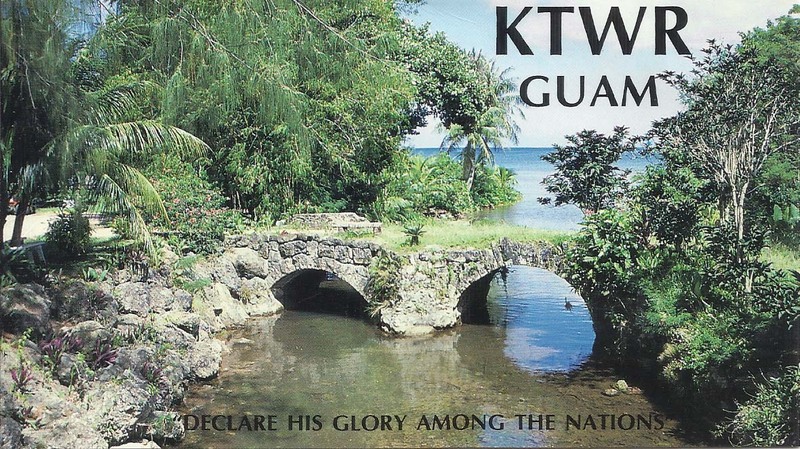 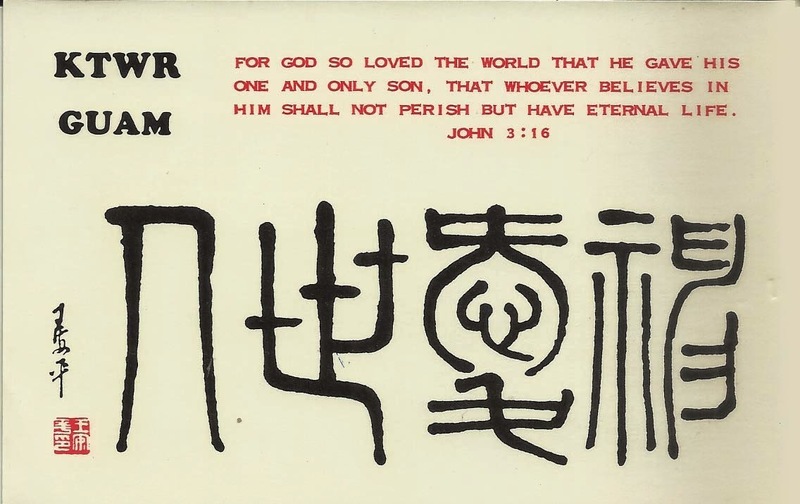 KTWR - Agana, Guam: 15240 kHz in Kokborok language at 1244 hrs to 1300 hrs UTC log on 24th August, 2014 and beautiful QSL card arrived on 3rd November, 2014 for my email report. 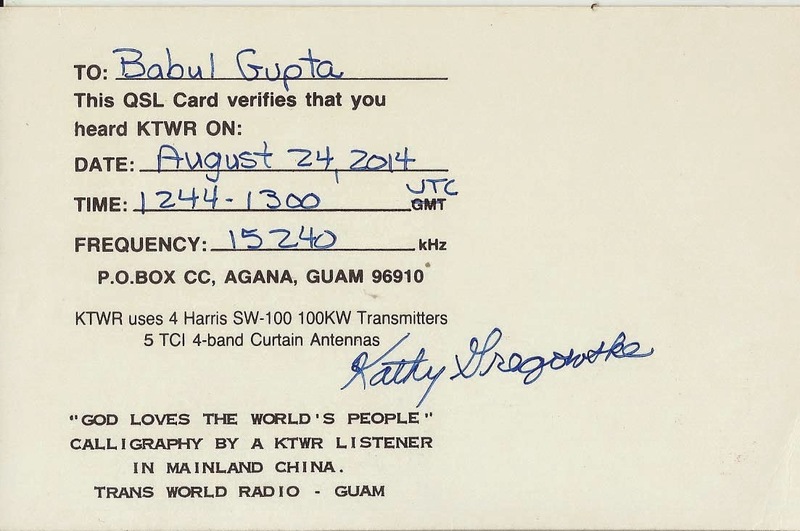 v/s Kathy Gregowske. 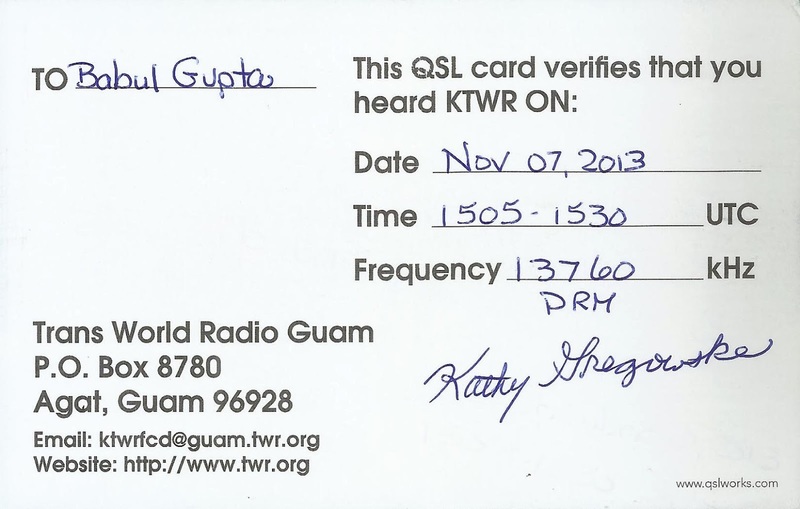 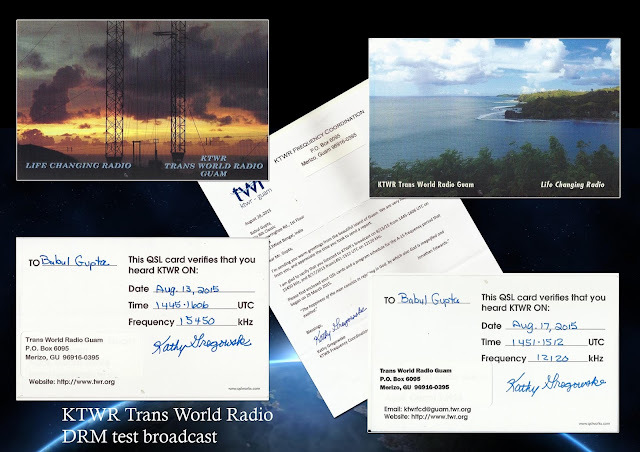 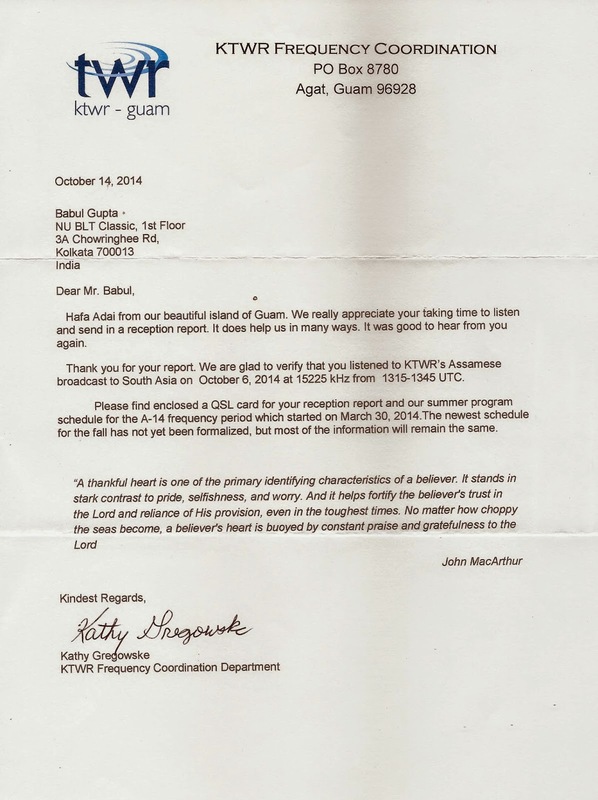 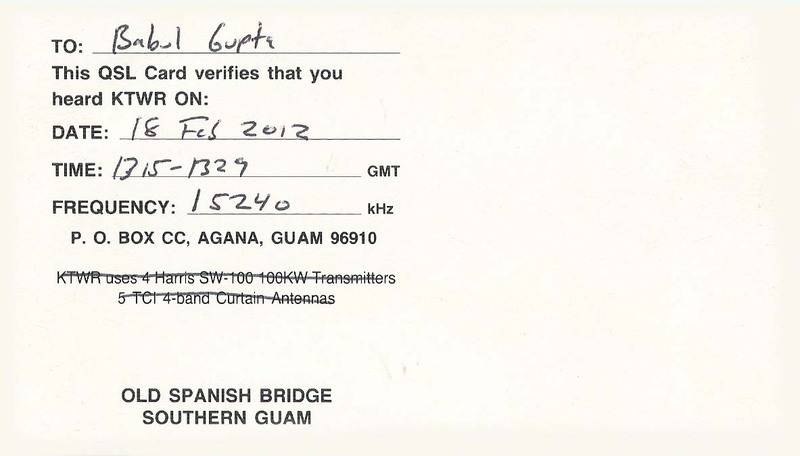 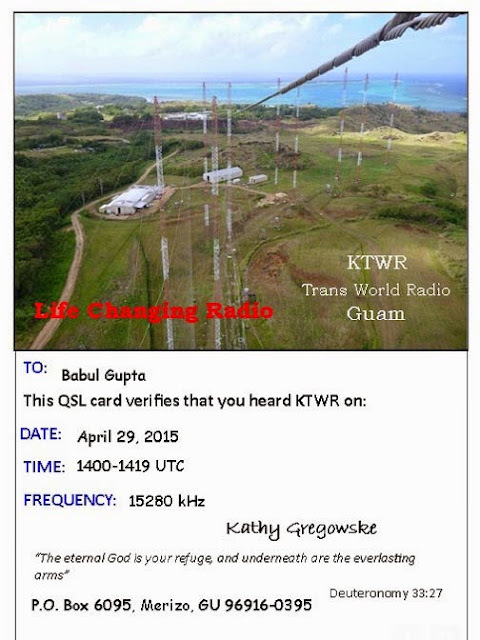 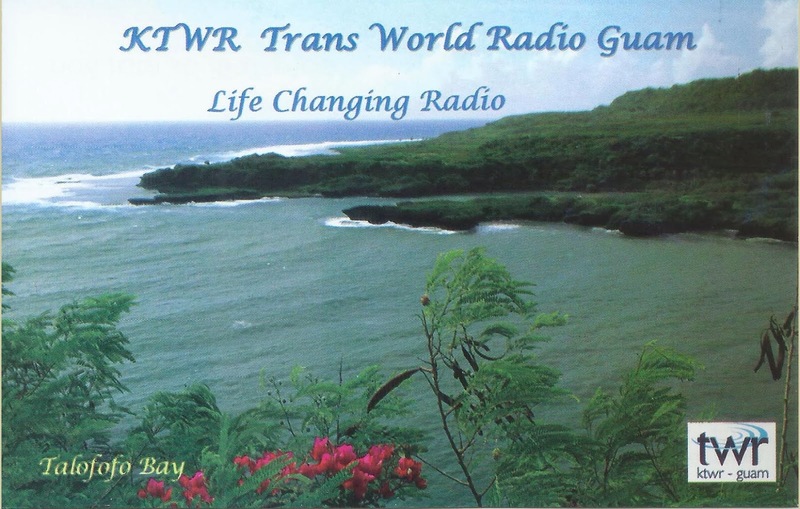 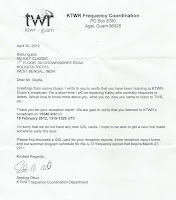 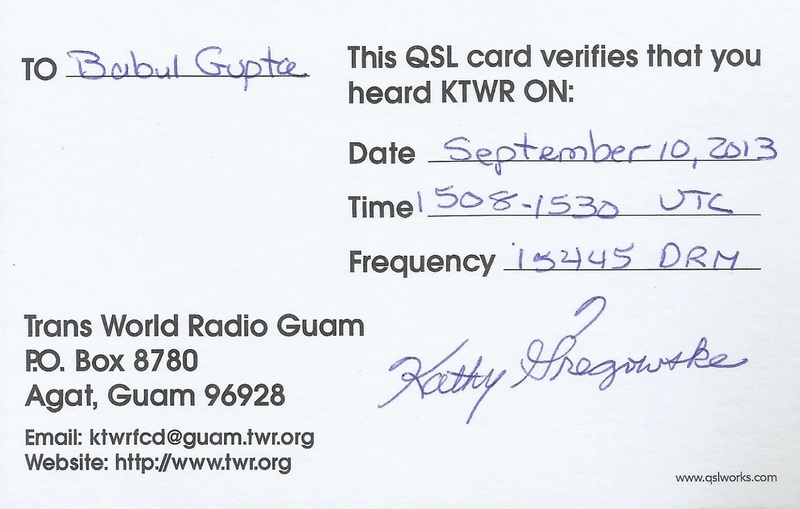 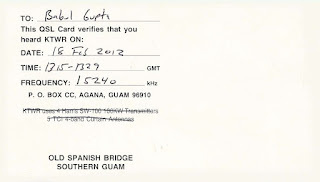 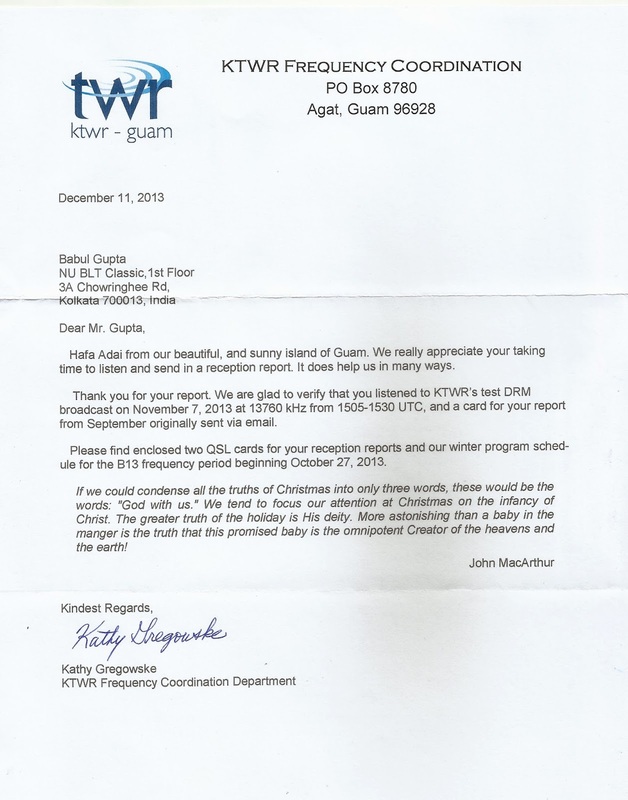 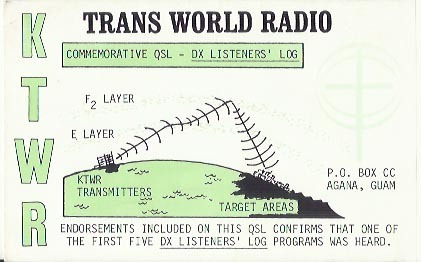 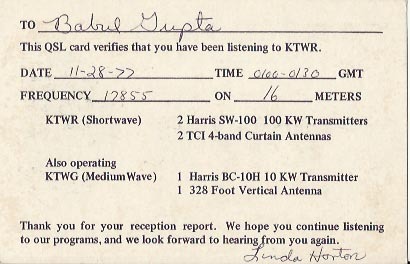 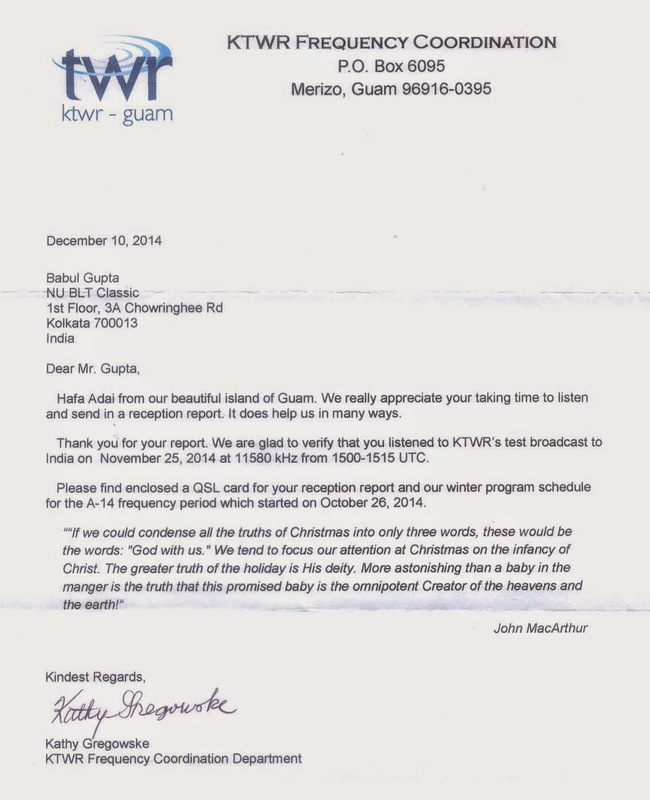 KTWR Trans World Radio - Guam: 11580 kHz test broadcast in Hindi at 1500 hrs to 1515 hrs UTC log on 25th November, 2014 and f/d QSL card with letter from Kathy Gregowske arrived on 22nd January, 2015 for my email report.